Dishes with green tomatoes are a rarity in the Pacific Northwest, but in the South there are several dishes that take advantage of the sweet flavor of unripe tomatoes. Fried green tomatoes are perhaps the best-known but there are many ways to use those tomatoes that have been plucked early from the vine. 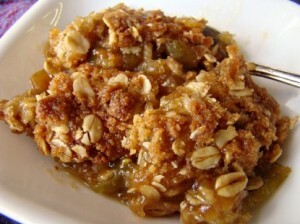 In describing the delights of a green tomato apple crisp, Jolene George at The Oregonian says that green tomatoes “convincingly cuddle up to the richness and the texture of local apples.” Serve this perfect union of tomatoes and apples with vanilla ice cream. 1. Melt the butter in a medium nonstick sauté pan over medium high heat. Stir in the almonds, oats and sugar. Cook while stirring constantly for 3-4 minutes, or until lightly browned. Pour the mixture onto a baking sheet and spread into a single layer to cool. 2. Sauté the apples and tomatoes in a medium sauté pan over medium heat for 5 minutes or until softened. Add the sugar and cinnamon. Reduce the heat and simmer for 1-2 minutes until slightly thickened. Serve topped with oats.